This proposal and the accompanying pull request describe a modification to the Scala type system that makes reference types (anything that extends AnyRef) non-nullable. There are two type hierarchies with respect to Null, depending on whether we're before or after erasure. Before erasure, Null is no longer a subtype of all reference types. Additionally, Null is a subtype of Any directly, as opposed to AnyRef. 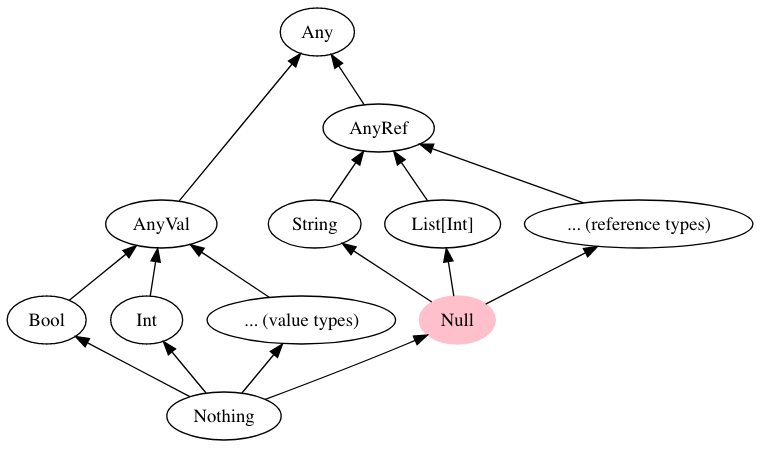 After erasure, Null remains a subtype of all reference types (as forced by the JVM). The new type system is unsound with respect to null. This means there are still instances where an expressions has a non-nullable type like String, but its value is null. // c.f == "field is null"
Enforcing sound initialization is a non-goal of this proposal. However, once we have a type system where nullability is explicit, we can use a sound initialization scheme like the one proposed by @liufengyun and @biboudis in https://github.com/lampepfl/dotty/pull/4543 to eliminate this particular source of unsoundness. Because of the unsoundness, we need to allow comparisons of the form x == null or x != null even when x has a non-nullable reference type (but not a value type). This is so we have an "escape hatch" for when we know x is nullable even when the type says it shouldn't be. This means that given x: String|Null, x.nn has type String, so we can call all the usual methods on it. Of course, x.nn will throw a NPE if x is null. Of course, this is also unsound and a2 could end up with a null value in it. The compiler can load Java classes in two ways: from source or from bytecode. In either case, when a Java class is loaded, we "patch" the type of its members to reflect that Java types remain implicitly nullable. JavaNull is an alias for Null with magic properties (see below). We illustrate the rules for nf below with examples. The first two rules are easy: we nullify reference types but not value types. In rule 3 we nullify type parameters because in Java a type parameter is always nullable, so the following code compiles. Suppose we have a BoxFactory[String]. Notice that calling makeBox() on it returns a Box[String]|JavaNull, not a Box[String|JavaNull]|JavaNull, because of rule 4. This seems at first glance unsound ("What if the box itself has null inside? "), but is sound because calling get() on a Box[String] returns a String|JavaNull, as per rule 3. Notice that for rule 4 to be correct we need to patch all Java-defined classes that transitively appear in the argument or return type of a field or method accessible from the Scala code being compiled. Absent crazy reflection magic, we think that all such Java classes must be visible to the Typer in the first place, so they will be patched. Rule 5 is needed because Java code might use a generic that's defined in Scala as opposed to Java. In this case, since Box is Scala-defined, nf is applied to the type argument T, so rule 3 applies and we get Box[T|JavaNull]|JavaNull. This is needed because our nullability function is only applied (modularly) to the Java classes, but not to the Scala ones, so we need a way to tell Box that it contains a nullable value. Rules 6 and 7 just recurse structurally on the components of the type. The implementation of rule 7 n the compiler are a bit more involved than the presentation above. Specifically, the implementation makes sure to add | Null only at the top level of a type: e.g. nf(A & B) = (A & B) | JavaNull, as opposed to (A | JavaNull) & (B | JavaNull). Here, all of trim, substring and toLowerCase return a String|JavaNull. The Typer notices the JavaNull and allows the member selection to go through. However, if someJavaMethod were to return null, then the first member selection would throw a NPE. // Additionally, we need to handle the `else` branches. users cannot directly write the JavaNull type (in this sense, JavaNull is similar to Kotlin's platform types which are too non-denotable). Instead, users can only write Null, which is more restrictive. def foo(s: String|Null) = ??? When looking for an implicit conversion from A|JavaNull to B, if we can't find it, then also look for an implicit conversion from A to B. This is done for ease of interop with Java. A vanilla application of nullification will turn the above into def trim(): String|JavaNull. However, inspecting the function contract in the javadoc reveals that if s is a non-null string to begin with, then s.trim() should in fact never return null (if s is null, then s.trim() should throw). From the point of view of Scala it is then preferable to have a more precise signature for trim where the return type is String. In general, this is a problem for many methods in the Java standard library: in particular, methods in commonly-used classes like String and Class. We address this by maintaining a whitelist of methods that need "special" treatment during nullification (e.g. nullify only the arguments, or only the return type). Currently, the whitelist is hard-coded in Dotty, but the plan is to use an annotated version of the Java JDK with nullability annotations produced by the Checker Framework (hat tip to @liufengyun and Werner Dietl for suggesting this). The toString method is a special case where we chose to trade away soundness for precision and usability. toString is special because even though it lives in scala.Any, it actually comes from java.lang.Object and it could, in principle, be overriden to return null. However, changing toString's signature to return String|JavaNull would break too much existing Scala code. Additionally, our assumption is that toString is unlikely to return null. This means the signature of toString remains def toString(): String. Our strategy for binary compatibility with Scala binaries that predate explicit nulls is to leave the types unchanged and be compatible but unsound. def foo(): String = ??? The first option is unsound. The second option matches how we handle Java methods. val o: Old[Boolean] = ??? So really the options are between being unsound and being too conservative. The unsoundness only kicks in if the Scala code being used returns a null value. We hypothesize that null is used infrequently in Scala libraries, so we go with the first option. val o: Old = ??? If the offending API consumes null, then the user can cast the null literal to the right type (the cast will succeed, since at runtime Null is a subtype of any reference type). def foo(s: String): Unit = ??? We added a simple form of flow-sensitive type inference. The idea is that if p is a stable path, then we can know that p is non-null if it's "compared" with the null literal. This information can then be propagated to the then and else branches of an if-statement (among other places). val s: String|Null = ??? If the test had been (if (s.isInstanceOf[String])), we currently don't infer non-nullness. var s: String|Null = "hello"
val s2: String|Null = ??? Let NN(cond, true/false) be the set of paths (TermRefs in the compiler) that we can infer to be non-null if cond is true/false, respectively. Inferred nullable unions: Dotty currently never infers a union type; instead, the union is eagerly widened. (see #4687). def foo2(): String|Null = "hello"
Otherwise, the nullable type String|Null would be collapsed to Any, which loses too much information. Notice that the type of Array(42) is synthesized as Array[Int], even though the (correct) type Array[String|Int] could be inherited. The problem is that the compiler sees a prototype of Array[String|Int]|Int, and because the outer type is a union it discards the prototype and switches to synthesis. See https://github.com/lampepfl/dotty/commit/8067b952875426d640968be865773f6ef3783f3c for why this was done. val x: String|Null = ??? Shouldn't it be s == s2 in this code? can we also track the Recognize @NonNull annotation on actual PR?